When an institution encourages the free flow of ideas and doesn’t rigidly define the roles of its researchers, new and better solutions are the result. And free-thinking scientists are the sort of people who are attracted to a collaborative environment that encourages risk-taking. These are the enironments where ideas are grown. The McGowan Institute for Regenerative Medicine has that type of environment and how that came to be is explained by Deputy Director Stephen Badylak, DVM, PhD, MD, Professor in the Department of Surgery and Director of the Center for Pre-Clinical Tissue Engineering within the McGowan Institute. 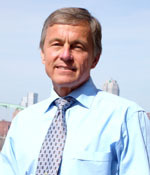 Dr. Badylak is a pioneer in his field of regenerative medicine and tissue engineering. His work on the use of biological scaffolds to support specialized structures goes back several decades. The idea of growing tissue from a matrix was new back in 1996, but now, about half of everything discussed at meetings for pioneers in regenerative medicine deals with this advancement. Approximately 90 related products are on the market now, mostly surgical mesh based on work that came from the Badylak Lab at the McGowan Institute. Millions of patients have benefited — people with ventral hernias, people with topical wounds. But the McGowan Institute has set its sights higher, on growing functional, enervated, vascularized skeletal muscle. It makes sense that the technology that allows for the creation and use of surgical mesh would also enable the growth of skeletal muscle, but no physician-researchers thought to expand it in this way. After all, surgical mesh has been around for a while, and it’s very useful in its current capacity. And not many physician-researchers are faced with severe traumatic injuries, either. So why did researchers from the McGowan Institute think to apply and adapt the matrix to a much more complex purpose? Dr. Badylak attributes the imaginative productivity of the McGowan Institute to its interdisciplinary nature.